This brand new itinerary gives you a chance to experience the beauty of the sleepy town of Canmore. The luxury of seeing the mountains by train is combined with the opportunity to explore the Canadian Rockies with the convenience and freedom of your own full size car. On this itinerary you will stay at the brand new property called The Malcolm Hotel featuring 124 well appointed guest rooms, outdoor heated pool, two outdoor hot tubs and more. You’ll spend two days on the Rocky Mountaineer between Vancouver and Banff. Upon arrival in Banff, you’ll pick up your full size car and drive to town of Canmore (approx 27km) check into The Malcolm Hotel for your 2 night stay. After your stay, you will drive to the Fairmont Chateau Lake Louise and stay at this iconic hotel. 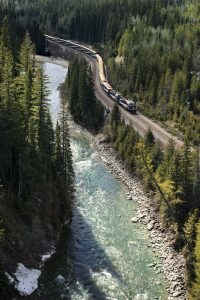 The Rocky Mountaineer & Canmore Self-Drive is available on select dates between April 14 to October 10, 2019.